Using the right costing methods to calculate true costs and margins is crucial to the success of any food company. Though business may look profitable, unexpected labor costs, freight charges and inventory pressures can mean that without proper costing methods, your margins may not be what you think they are. Things are great at Foodco. They were tough in the beginning, but now there's a steady supply of customers, and their signature product — chocolate pecan clusters — is practically flying out the door. Today's a typical day. A truckload of chocolate pecan clusters is being prepared for shipment to a top overseas customer. When the truck is full, it will take its goods to an airport facility, where eventually a plane will carry the perishable goods to the customer’s home country. Thanks to careful accounting of all the materials that went into the clusters, Foodco knows that they pay their suppliers precisely $100 for each pallet of pecan clusters they make. They also know that the typical pallet requires 12 people-hours of labor to produce, and they know what that costs, too. By crunching the numbers, they calculate their chocolate pecan cluster margins at 8%: comfortably above the company’s 6% cost of capital. As the truck is being loaded, the phone rings. It's the customer who's waiting for the candy. They just realized that Foodco now offers chocolate cashew clusters, and they desperately want two pallets; anything with cashews has always sold well for them. Foodco promises it's not a problem. Bob is asked to put together two pallets of the new chocolate pecan clusters. He grabs a couple of other people off the shop floor to help get it done quickly. The truck driver is asked to wait while Bob does his work, and in the end the extra pallets are squeezed on to the nearly full truck and the door is shut. The last two pallets are added to the invoice; everyone is happy. That's because they don't know. They don't know that the half hour Bob and his colleagues spent putting together that pallet cost the company $120 in lost time. And while they do know that they were charged extra while the truck waited, they're not bothered by it because they know it was the right thing to do. They don't know that adding weight to their typical truckload is going to impact their freight charges; they simply forgot about that. The upshot is that they don't know they are losing money. The extra labor, waiting time and freight charges whittled their margin down to 5% on that truckload — a full point below their cost of capital. With margins so slim to begin with, it didn't take much to make that happen. Foodco is losing money, and they don't even know it. Worse, this shipment was not atypical. Foodco makes last-minute adjustments like this all the time. It's part of their commitment to great customer service. That’s the danger of not calculating your true costs. If you take costing shortcuts, only one thing is certain: your margins are not what you think they are. The solution is simple in concept, but not in practice: use the right costing methods. In essence, there are different ways you can calculate your costs, and for any given situation there is an ideal costing method that is more appropriate than the others. The following pages outline the most critical costing methods and when it’s appropriate to use each one. 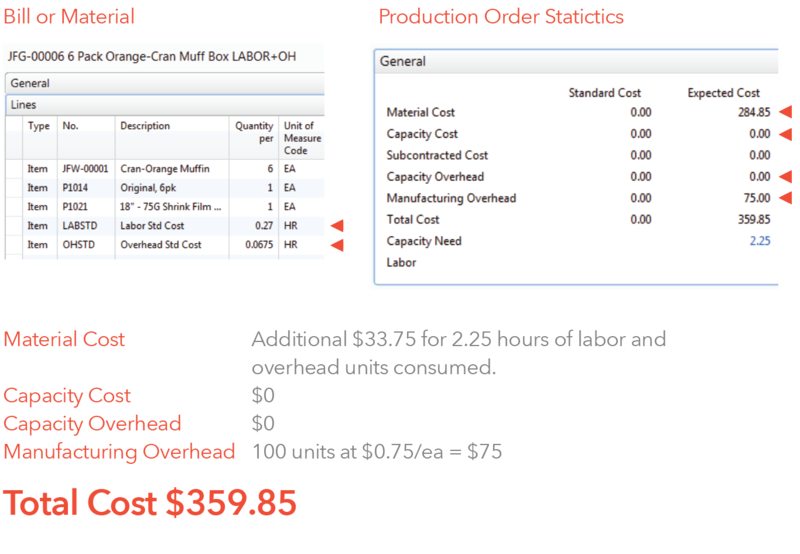 Manufacturing overhead is calculated at $0.75 per unit. This is the most straightforward method. A typical application for this method is when you have a machine (like a mixer) that requires an operator to load ingredients and monitor the machine while it produces a batch every few minutes. Things are simple here because the overhead usage is relatively constant whenever the machine is on. When all items going through a particular work center have the same labor and overhead costs, and there are no significant changes to labor and overhead hourly rates from one run to the next, this is the method to use; it captures what you need to know without unnecessary complexity. Labor and overhead rates are expressed as a rate per hour. 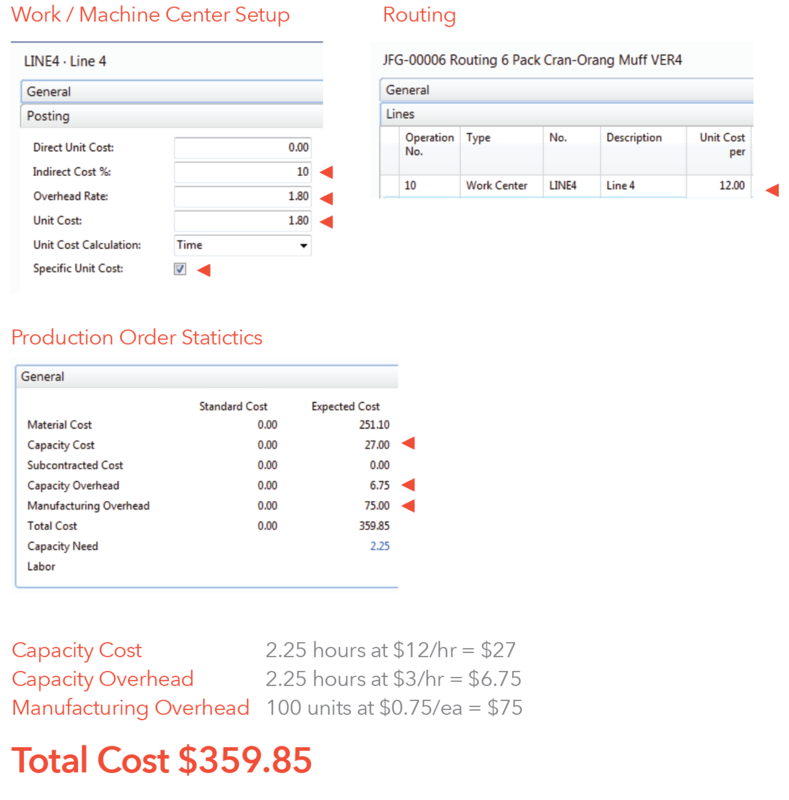 Costs accumulate based on the setup hours and runtime hours of the work center. All items going through a particular work center have the same labor and overhead costs, and there are no significant changes to labor and overhead hourly rates from one run to the next. How are labor and overhead costs applied? 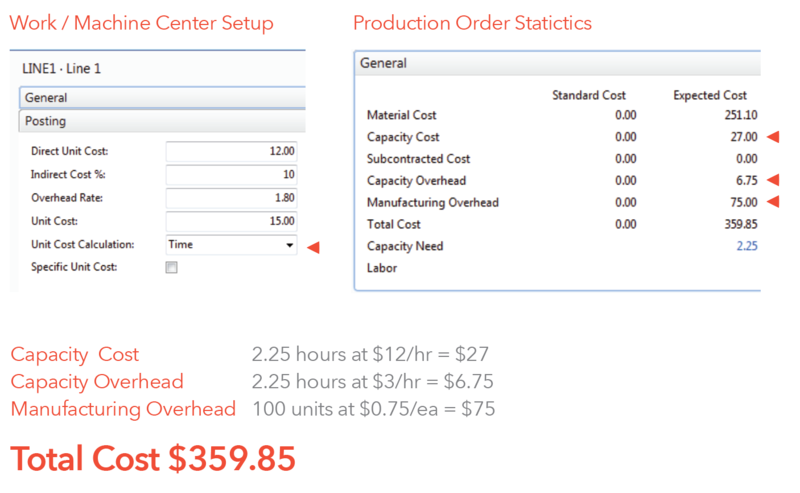 Costs accumulate based on the work center’s setup runtime hours. An operator monitors running equipment. The concept here is much as in the previous method, except here we focus on units produced rather than on production time. Things here are still pretty straightforward. A typical application for this method is when you have a production line that ends at a packaging station. Packaging time can be affected by occasional production line slowdowns. If all the items being packaged have the same ideal overhead costs with no variation from one run to the next, then we don’t want to capture occasional slowdowns as contributing to the cost of the goods that were packaged during the slowdown. That would make things more complicated with no benefit. When all items going through a particular work center have the same labor and overhead costs, and there are no significant changes to labor and overhead per unit rates from one run to the next, this is the method to use. The labor and overhead rates are expressed as a rate per unit. The costs accumulate based on reporting the number of units produced at the specific work center. All items going through a particular work center have the same labor and overhead costs per unit, with no significant changes to labor and overhead per unit rates from one run to the next. 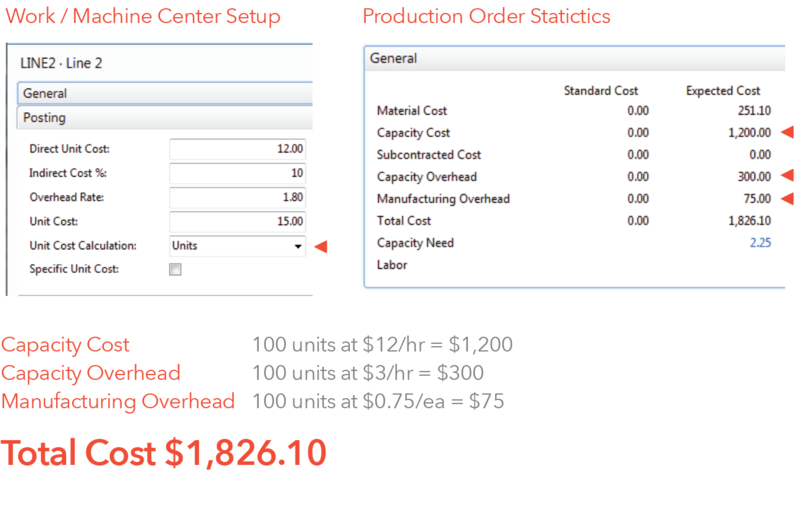 Costs accumulate based on the quantity produced at a specific work center. An operator is packaging finished goods at the end of the production line that occasionally slows down due to upstream holdups. We don’t want to recalculate the cost of each unit based on these occasional slowdowns; we want the same overhead allocated to all units produced. Things get more complicated with this method, but in the right kind of scenario, it’s the best way to measure your actual production costs. The right time to use this method is when two or more products share a common production process and labor and overhead rates, but one consumes more labor and overhead than the other. In this scenario, it isn’t important to separate labor costs and overhead costs, so they’re grouped together as one cost. The two products will have different costs in the end because the amount of overhead is not the same for both, even though they both incur the same overhead rate. 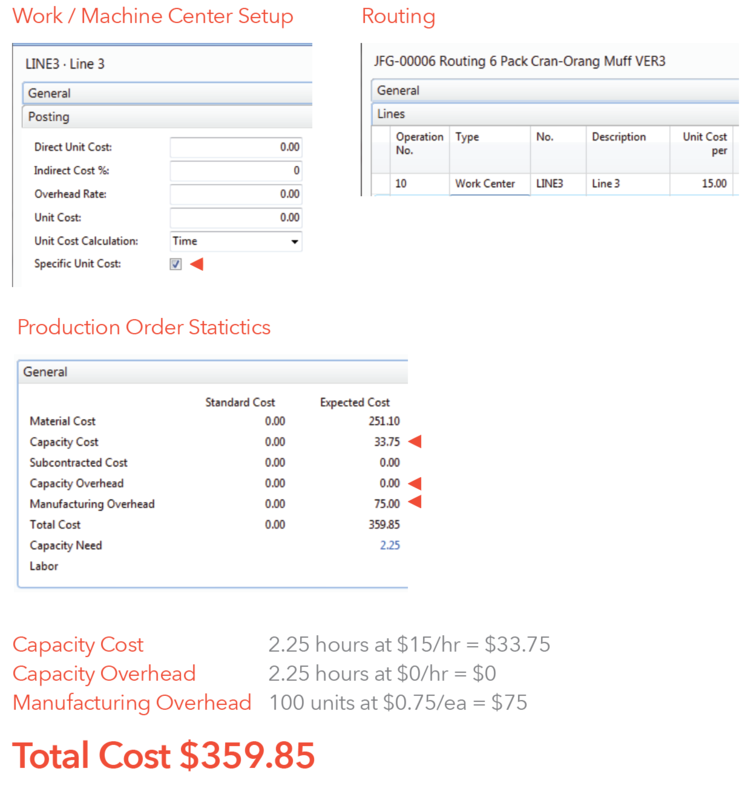 When the hourly overhead rates are the same for different products that share a production process, but the amount of labor is different from one product to the next, this costing method captures an accurate picture of your true production costs. As with the previous methods, it’s important that there are no significant changes in the hourly rate from one run to the next. For example, if Product A requires 30 minutes of a packer’s time while Product B requires 15 minutes, those incur the same overhead rate because the packer is paid the same hourly rate in both scenarios. If product B required 15 minutes of a manager’s time, the hourly rate would be different and this method would no longer be ideal. All items going through a particular production process (the routing operations) have the same labor and overhead hourly rate, with no significant changes to labor and overhead hourly rates from one run to the next. Costs accumulate based on the routing operations’ setup and runtime hours. A blending operation requires one operator to load ingredients when running product A, but it requires two operators when running product B due to the speed of the line. Although the work center is the same for both products, the labor and overhead costs vary by product based on an hourly rate. This method is very similar to Method 3, except here only the labor costs vary between the Products A and B. Recall that in Method 3, both the labor and overhead costs varied between Products A and B. The right time to use this method is when two or more products share a common production process and labor and overhead rates, but one consumes more labor and overhead than the other. In this scenario, it isn’t important to separate labor costs and overhead costs, so they’re grouped together as one cost. The two products will have different costs in the end because the amount of overhead is not the same for both, even though they both incur the same overhead rate. Our final costing method provides the most flexibility, for when labor and overhead rates are constantly changing. That can happen, for example, when there’s wide variation in the quality of inputs, meaning some products cost more to produce than their seemingly identical neighbors. Products that begin as fresh produce are a good example. The quality and size of the produce can have a big impact on the labor needed to turn it into a finished product. The essential principle with this method is that labor and overhead are treated as items on the bill of materials. Essentially, they are ingredients. That gives you maximum flexibility to respond to fluctuating costs by adjusting the BOM. Now that you know the top costing methods used in the food production industry, give some thought as to which ones are most appropriate for your operation, and begin applying them as soon as possible. Only then can you know your true costs and margins with precision, and make effective tactical and strategic business decisions accordingly. If these methods are new to you, you may want to get some help from an industry expert (you want more than just costing expertise — you want specific expertise with the nuances of costing in the food industry). The investment in getting this right can quickly pay for itself, so do consider outside expertise if the subject matter of this whitepaper is new to you. Having business software that’s effective, flexible and easy to use will also contribute to making precise costing possible and practical.